Founded in 1800 by inspectors of the Inland letter-carriers called Ferguson and Sparkes, until 1836 the Post Office London Directory consisted mainly of an alphabetical list of names of merchants and trades in London with their occupations and addresses. The first edition in 1800 had only 250 entries; by 1839, just three years after Frederick Kelly took over the company, the directory ran to 1,187 pages with many dedicated to advertisements of one kind of another. By the time that this edition was published in 1858 (1), Kelly was issuing two versions of the directory annually: a shortened edition shown here, containing 2570 pages of close-set type, which included 366 pages of advertisements; and the full edition – in 1858, a book 11-cm thick (2). 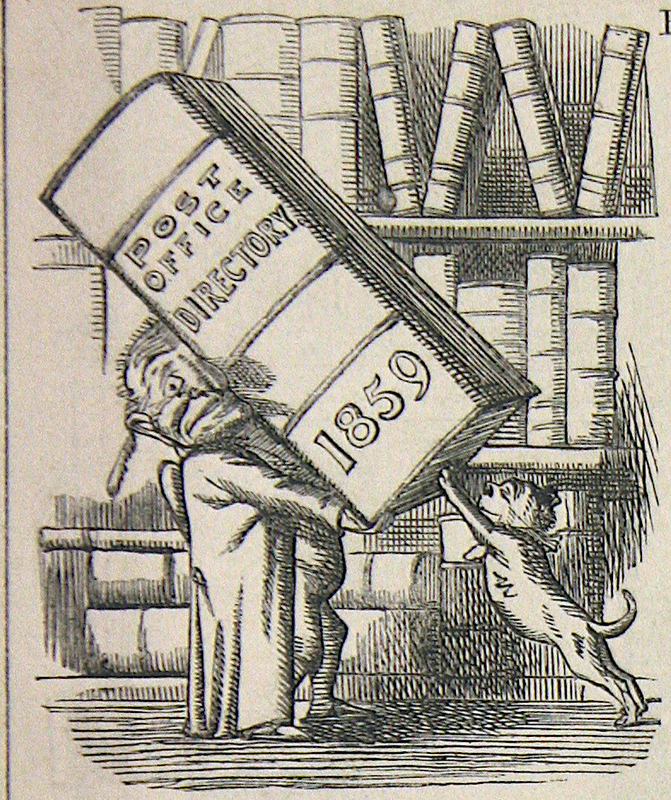 From the early 1850s, Punch remarked upon the increasing bulk of Kelly’s London directories. In 1853, picturing a man carrying the enormous book on his back (3), Punch argued that the directory ‘laid open’ the ‘mysteries of the streets of London’ with a minuteness that even the most comprehensive city guidebook could not compete with. As an enormous encyclopaedia of London, the directory ‘not only contains all that we want to know, but precise information as to at least a couple of millions of people whom … we sincerely hope that we shall never know’. 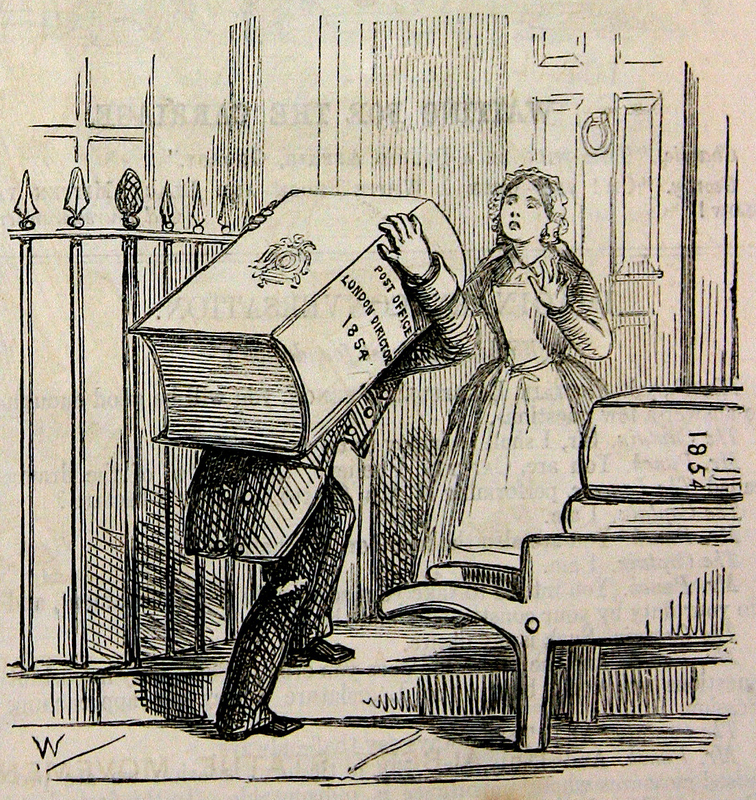 By 1859, Punch’s version of the London directory had grown to man-size proportions (4). Drawing attention to its materiality – six inches thick and weighing half a stone – the journal wondered at the work involved in the production of the directory but, as before, thought that most people would never read it, despite the fact that it would be often in their hands for the ‘occasional dip’. Nice post – the illustrations are great – especially the one-eyed chap being semi-crushed by the directory. Thanks Phil. A shame these things no longer have the same effect. Hope all’s well with you & family in southern climes.